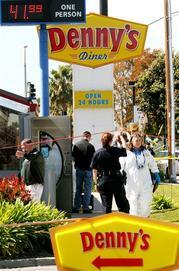 Killer Rampage Dude walks into a Dennys carrying a semiautomatic handgun AND a revolver. That's, what?, 15 rounds before he even reloads? Frankly, we're always surprised, when these things happen, that so FEW people are killed. Columbine, the DC sniper spree, even Sept. 11, when initial reports estimated a death toll of 10,000. Yes, terrible things happen in the world. Anyone else notice how frequently, though, terrible things fail to happen?